Since the very beginning of time, there have been those who have believed that the Earth is flat. If seeing is believing, throw away your Flat Earth Society membership and take these steps. A few weeks ago, Grammy-nominated rapper BoB told the Twitterverse that the Earth is flat. His epiphany apparently came during a 2012 flight made at the same time that Austrian skydiver Felix Baumgartner was leaping from a balloon high in the Stratosphere above New Mexico. The pilot on BoB’s flight told everyone on board to look out the window to see the sun glinting off Baumgartner’s balloon floating five miles away. When BoB saw Baumgartner’s balloon but not the curvature of the Earth, he followed in the footsteps of centuries of sceptics and concluded that the Earth is flat. Apparently, BoB is not alone. Google Trends have reported a sharp increase in people searching “Is the Earth flat?” over the past few months, and a poll in the British newspaper The Telegraph had 7% taking BoB’s side. BoB had reasoned that no matter where he’d been or how high he’d flown, he’d never seen first-hand evidence that the Earth is round and since seeing is believing, he’d chosen to disbelieve. If you believe that the Earth is round, or are at least willing to give that theory a chance, where on Earth can you venture to de-bunk BoB? The view from a British Concorde—the curvature is visible. Obviously space, or very high altitude, is your best bet. Unfortunately however, although space tourism is edging ever closer, it’s still not quite here which means that we can rule out that particular vantage point at least for the time being. Until a decade or so ago, Concorde was the next best thing. I took the above photo from a British Airways Concorde at about 58,000 feet on a “trip to nowhere.” It was taken with my brother’s old Pentax SLR and a standard 30mm (ish!) lens. Pressing my nose against the aircraft’s window and gazing from side to side, the curve was even more pronounced than the photo suggests, but these days I have to settle for those pictures to assure myself that BoB is mistaken. Although Concorde no longer flies, there are similar aviation opportunities using retired military fighter aircraft in Moscow. Sadly, they make Concorde look like a bargain which means that most of us must turn to more terrestrial alternatives. But is it possible to view the curvature of the Earth without taking to the sky? When I was in Chile a short while ago, I met a couple from California who had started their travels on Easter Island. They claimed that while standing on a particularly high point and gazing out at the endless ocean, they could clearly make out the curvature of the Earth with their naked eyes. Many of us have had similar experiences when perched on cliff tops and looking seaward, but is it just our minds playing wishful tricks? 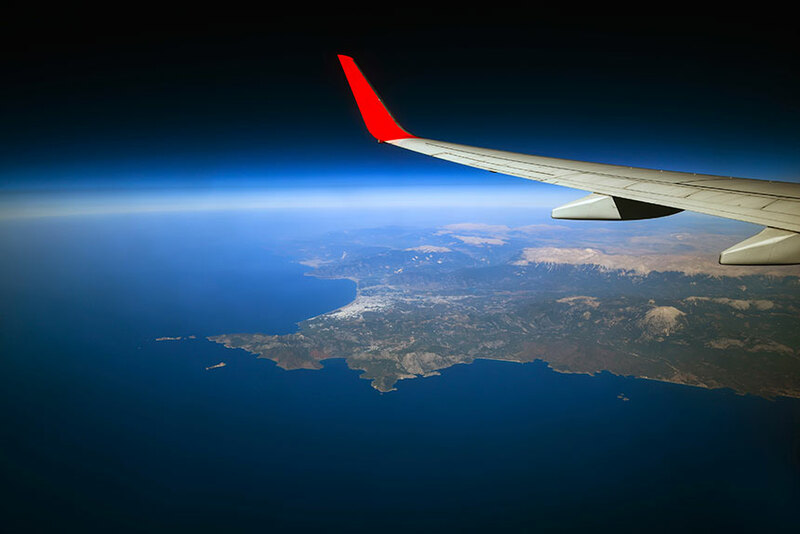 Scientists say that anyone flying at 35,000 feet on a clear day and with at least a 60-degree field of view will be able to discern the curve. However, when it comes to seeing it from ground level, many suggest that while it’s theoretically possible, it’s not guaranteed. If you do want to challenge BoB, there are a few things you need to take into consideration. Firstly, you need decent elevation in order to be able to see as much horizon as possible. The higher you get, the more horizon you can see and the greater the chance of discerning a curve. Secondly, you need that horizon to be flat: no buildings, mountains or hills to interfere or distract. Coastlines are often best, as a large expanse of water tends to provide the least undulating horizons on our planet. Thirdly, you need a good clear day: no smog, fog, smoke, haze or cloud. Skyscrapers might do the trick, but they’re not always surrounded by flatness and their views are often at least somewhat obscured by pollution, other buildings or, in the case of Dubai’s Burj Khalifa, often heat shimmers and haze. While mountains are often even higher, most of the world’s highest peaks are in the middle of mountain ranges and therefore when standing on top of Mount Everest, for example, any chance of seeing the curvature is spoiled by the peaks of the surrounding Himalayas. If you do give it a go and think you can see the curvature but fear it may just be your eyes playing tricks, there is an experiment you can perform. Take two sticks – or tripods, ski poles, ice-axes etc – and place them in front of you. String fishing line or any monofilament between the two using a spirit level to ensure that the line is perfectly straight. Then move back until your vantage point allows the filament to be aligned with the horizon. If they line-up perfectly, you’re not witnessing the curvature of the Earth. However, if there’s any discernable and consistent dip of the horizon away from the string, you are indeed seeing the curvature of the Earth. One day, I’m going to trek to that Easter Island hill-top to perform the experiment myself, and maybe I’ll take BoB with me! What’s the Deal with Air Transat’s Transatlantic Gluten-Free Airline Food? The picture is very clearly not taken from a Concorde. Not sure why you are lying here. Hi Mika, you’re absolutely right—except we weren’t lying intentionally! We recently redesigned our website and a bunch of photos from the earlier design didn’t make it through in the transition; that one of the Concorde disappeared somewhere. I’ve dug through the archives to find it and clarified the column. Thanks for pointing it out!